A multitude of photographs accompany bold, simple text, teaching rudimentary ideas of differentiating what’s living and what’s not—and noting that it’s not as simple as it may seem. Every photograph is striking and colorful, sure to keep readers engaged. The first pages show photographs of things unmistakably living—from polar bears to cactuses—or nonliving—from a cresting ocean wave to a sea of automobiles. The heart of the text uses a few simple questions to try to determine what makes something living or nonliving, beginning with, “Are living things the only things that move?” A droll, humorous photomontage shows a droopy-eared basset gazing up at wildly swinging monkeys as a snail crawls nearby. The page turn reveals breathtaking photos of nonliving things that move—clouds, trains, waterfalls—and living things that (arguably) cannot move—coral, a tree, fungi. Growth, change, reproduction, and the needs for food, water, and oxygen are all examined similarly, leading to the conclusion that “Not even scientists have a perfect answer” to the question of what differentiates living from nonliving. 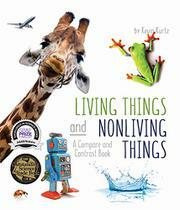 A thoughtfully laid-out double-page spread concludes that there are five basic activities which usually guarantee that something is “probably a living thing.” Finally, there are four pages of enrichment activities, including colorful checklists that help reassure readers that such things as frogs are living, while robots and amethysts are nonliving. A Spanish-language edition, Seres vivos y no vivos, publishes simultaneously.